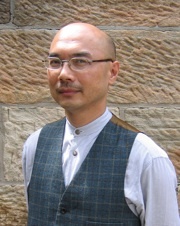 Leong K. Chan is Associate Professor in graphics/media at the University of new South Wales, Sydney. He holds the position of Director of Postgraduate Research in the Faculty of the College of Fine Arts. Leong lectures in design, culture and society, and information design. His research focuses on cultural identity, graphic design and national experience in Hong Kong and Singapore; visual culture and the Chinese diaspora; and graphic responses to HIV/AIDS. He is co-research director and co-chief investigator of the ARC-funded Australian Socio-Graphic AIDS Project (AGAP), and the South-East Asian Socio-Graphic AIDS Project (SEAGAP). These two research projects document the trajectories of HIV/AIDS through the material and visual cultures, public health campaigns and socio-graphic representations of the epidemic. The printed image has historical and contemporary associations with the visual rhetoric of propaganda. Propaganda in its broadest definition concerns the spread of doctrine, change of behaviour through persuasion, and the manipulation of behaviour, and operates at three levels - myth, ideology and action (Margolin 1979). Since the eighteenth century the printed image has played a significant role in the construction of identity - both cultural and political - of European nations. In the process of nation building, notions of ideology and myth are evoked in images and texts generated by the state to inculcate the sense of belonging through ethnic ties and sentiments. This configuration of a pre-existing ethnic identity as the baseline for a stable entity is problematic for post-war nations like the Republic of Singapore which emerged from a colonial past with multiracial constituents. This paper explores the crucial role that the printed image plays in our understanding of identity - cultural and political - in defining nationalism by examining the policy of multiracialism in Singapore through the visual culture of nation building campaigns. It analyses how the printed image is constructed and reconstructed as indices of government and public responses to the meanings of multiracialism and ethnicity.